The installation combines video, objects and performance to merge sites of production, consumption and disposal in a single space. iTrust transcends into the cloud and returns as a pre-modern fetish. Silent contemplation displaces electronic communication overload. Physical presence meets mental distraction. A prayer to progress? Let us irritate you – it hurts just a little bit. Bring your mobile device. 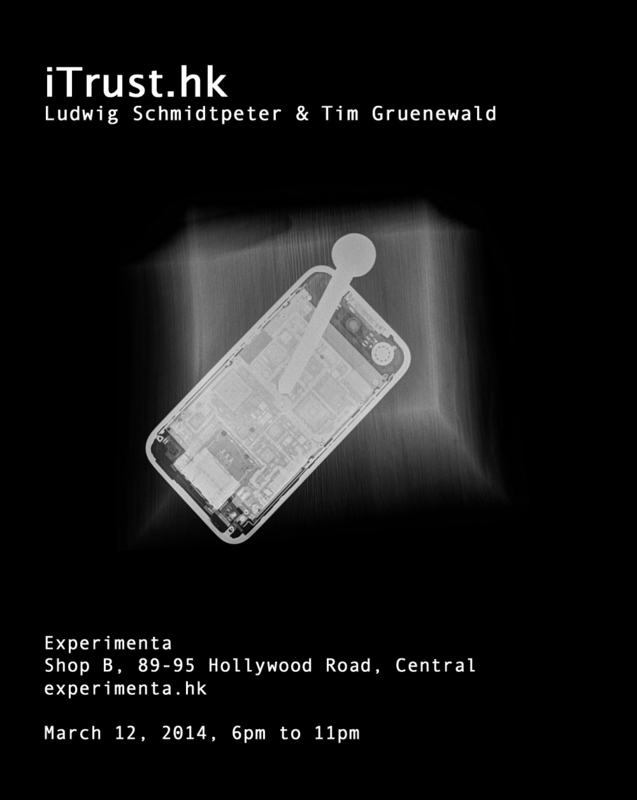 The project iTrust.hk engages artistically with the mobile revolution. In the past ten years, the advent of the smart phone and the tablet has untethered the interface between humans and the Internet. Small screens are omnipresent in private and public life and connect us continuously to the virtual realm. We are constantly tempted to disconnect from the here and now in order to communicate across time and space and consume information from the cloud. The mobile device thus transcends the physical world. The Cloud has replaced Heaven as the metaphor for infinite possibilities. At the same time, the devices themselves have been elevated far beyond their mere use value as communication and information tools by the product policies and marketing strategies of global concerns. Smart phones have become the primary objects of desire for conspicuous consumption to display social status in the public sphere. In extreme cases, the presentation and reception of new products borders on the cultish and quasi-religious. The iDevice has become the cult image of our time. A third aspect of the mobile revolution concerns the origin of mobile devices. Through globalization, sites of production and consumption of electronic devices have been strictly separated. We do not know the origin of devices that are in our palms all day and on the bedside table all night. What happens if the spaces of production and consumption are collapsed into one? Through a constellation of performance, objects, installation, and images we attempt to open up possibilities of reflection on the deeper implications of the mobile revolution. Gina Wong, Peter Breed, Markus Towae, Klas Ehnemark, Zoe, Flora Yin-Wong, Kaki Li, Vivian Wong, Patrick and Ming, Ben from Visage One, and the guys from Cocotte who made things happen.